The GSI AudioStar Pro™ is a versatile two-channel clinical audiometer designed to perform efficient audiometric evaluations on every patient population. It may be used independently or with a computer for HIPAA compliant data storage and EMR/EHR compatibility. From the extra large display that reduces eye strain, the ergonomic housing that maximizes hand and wrist comfort, to the light pipes around selected test buttons, the AudioStar Pro is designed for the busy audiologist. 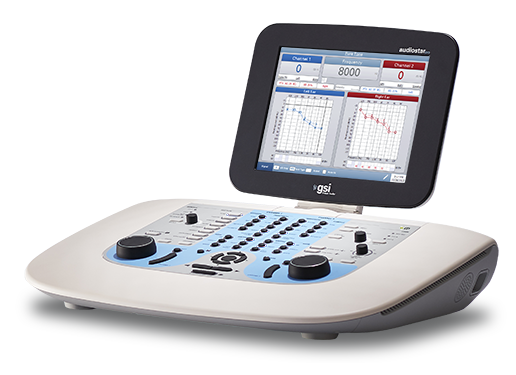 The GSI Pello™ is an adaptable and portable audiometer with a small footprint and familiar Grason-Stadler design. This mid-level audiometer is the perfect solution for a small or growing practice because of its flexibility. Four configuration options allow each facility to mix and match features based on clinic and patient's needs. 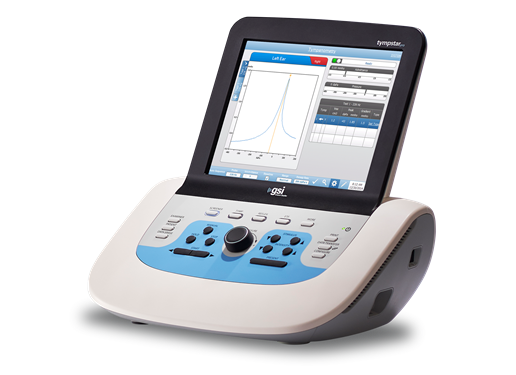 The GSI 39 Auto Tymp™ is a flexible screening product for tympanometry, acoustic reflex measurements, and audiometry. The tympanometer is available in five different versions to meet the unique demands of each facility. All five versions are fast, versatile, and easy to use. It is possible to add additional modalities such as audiometry, contralateral reflexes, or 1,000 Hz probe tone as the facility testing requirements expand. With its unsurpassed durability, the GSI 18™ is designed to be the one solution for every hearing screening situation — from educational institutions and industrial settings, to physicians’ offices and managed care facilities. Plus, its ergonomic design and logical navigation makes performing audiology tests simple. The GSI TympStar Pro™ tympanometer offers comprehensive middle-ear testing capabilities that support the needs of hearing healthcare professionals. Change parameters on the fly or interpret audiometric test results with the touch screen display. Protocols may be configured to optimize efficiency and workflow; the flexibility of pre-defined protocols saves time and creates consistency in testing procedures. The GSI Allegro™ is a handheld screening device ready to take on any testing environment that requires tympanometry and ipsilateral reflexes. The Allegro offers quick and easy testing with a familiar four button navigation. Automatic measurements of middle ear status are completed in seconds using configurable test settings. The GSI 39™ Auto Tymp is a flexible screening product for tympanometry, acoustic reflex measurements, and audiometry. The tympanometer is available in five different versions to meet the unique demands of each facility. All five versions are fast, versatile, and easy to use. It is possible to add additional modalities such as audiometry, contralateral reflexes, or 1,000 Hz probe tone as the facility testing requirements expand. 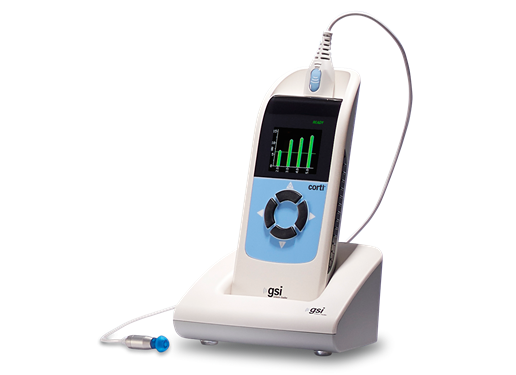 The GSI Corti™ is a portable, battery-operated diagnostic and newborn screening instrument that measures Otoacoustic Emissions (OAE) for infants, children, and adults. Offering the ability to rapidly screen newborns, the Corti meets worldwide recommended screening protocols and provides diagnostic OAE testing. The GSI Audera™ meets all of your needs for Evoked Potential testing by providing a unique combination of Auditory Evoked Potentials (AEP), Otoacoustic Emissions (OAE), and Auditory Steady State Response (ASSR) tests. CE-Chirp® and CE-Chirp Octave Bands with normative data are included as standard stimuli for threshold estimation. The GSI Novus™ is an AABR/OAE screener that features a touch screen display and intuitive software in a compact hardware design. The Novus may be configured with any combination of AABR, TEOAE, and DPOAE. GSI AMTAS™, or Automated Method for Testing Auditory Sensitivity is a patient-directed evaluation tool that uses patented test methods and accuracy algorithms to perform diagnostic or screening audiometry. AMTAS Pro™ software is run through a GSI AudioStar Pro or GSI Pello that is connected to a touch screen computer. GSI Suite™ is an audiologic data management solution that is compatible with the Pello, TympStar Pro, AudioStar Pro, AMTAS, Corti, GSI 39, and legacy products. With a single button press, data is transferred from the instrument to the software where it is stored or a report may be generated. GSI AMTAS, or Automated Method for Testing Auditory Sensitivity, is a patient-directed evaluation tool that uses patented test methods and accuracy algorithms to perform screening audiometry. AMTAS Flex™ software is run through a tablet computer with no audiometer required.